PBK Visiting Scholar: Victor S. Batista, "Converting Water into Fuel: Natural and Artificial Photosynthesis"
Please join us at the next chemistry departmental gathering, where we will recognize the Junior Scholar Award, W.D. Walters Teaching Award, and Catherine Block Memorial Fund Prize recipients. Open Advising and Faculty Drop-in Advising is available for students with questions regarding chemistry programs or courses. Come join alumni, faculty, friends and students at the ACS National Meeting for a social hour that includes hot and cold snacks and beverages. It is very close to the convention center. The retreat will focus on how the chemistry of guanine oxidation changes the biology of DNA. May Room, Wilson Commons, Sunday May 17th, 2p.m. A ceremony for the chemistry graduates of the Class of 2015. The presentation of the 2015 Harrison Howe Award to Dr. David W.C. MacMillan. The Senior Poster Session is an annual event which showcases all B.S. majors and their senior research. Please join us and support our seniors! The Department of Chemistry will host a memorial service to remember the life of Professor Esther Conwell. Come for student talks, poster presentations, discussion, games and food! Faculty, alumni and guests are invited to attend this special Meliora weekend event. 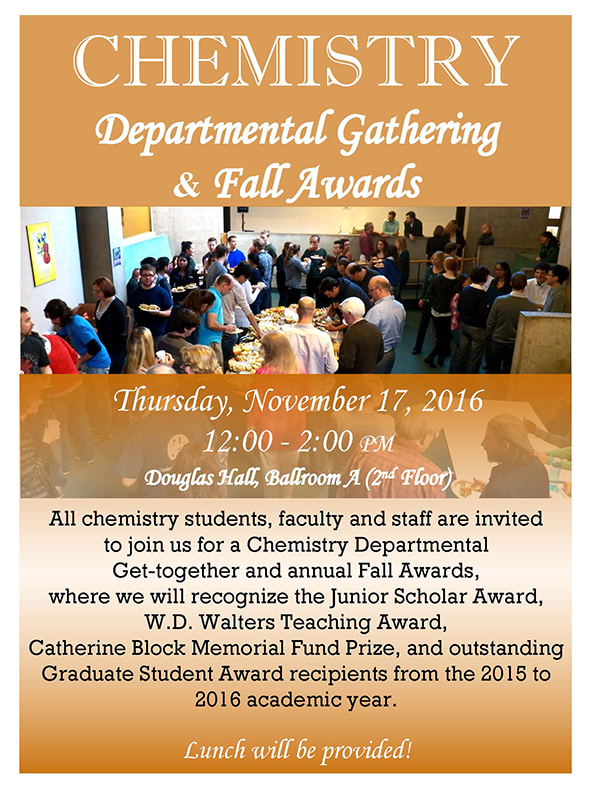 Please join us at the next chemistry departmental get-together, where we will recognize the Junior Scholar Award, W.D. Walters Teaching Award, and Catherine Block Memorial Fund Prize recipients. The retreat will focus on modeling the folding and native structures of protein molecules. The symposium topic this year is on bioinspired interfaces regarding the often complex interrelationships between bulk and surface properties of biological materials and synthetic soft materials. A ceremony for the chemistry graduates of the Class of 2014. There will be a reception following the award presentation and lecture in the Green Carpet Lounge of Hutchison Hall. A Happy Hour to enjoy refreshments with fellow Chemistry alumnaes. Brighton Town Park, 777 Westfall Rd. Chemistry REU students will present their research. This is a one-day symposium on the necessary innovations in materials science and engineering needed to advance catalytic applications in the coming decades. A ceremony for the chemistry graduates of the Class of 2013. Between 6AM and 8PM on January 8, there will be NO electrical power to the NORTH half of the 3rd and 4th floors of Hutchison Hall. Chemistry's summer research students will present their research results. Registration is now open for this one-day symposium on innovations in materials science and engineering necessary in order to advance energy-related applications in the coming decades. A ceremony for the chemistry graduates of the Class of 2012. An event to honor the many accomplishments in research, teaching, and mentoring of our colleague and friend, Rich Eisenberg. A ceremony for the chemistry graduates of the Class of 2011. The University of Rochester Chemistry Department is hosting the 56th annual American Chemical Society (ACS) Undergraduate Research Symposium. The Harrison Howe Award is dedicated to the memory of Harrison E. Howe, 1881—1942, a cofounder of the ACS Rochester Section and a well-known chemist, editor, and author. Nanoscience and Nanotechnology: Why Size Matters? Pittsford Barnes and Noble Community Room (2nd floor), 3349 Monroe Ave.
Prof. Xiaowei Zhuang of Harvard University has been selected to receive the Second Magomedov-Shcherbinina Memorial Prize, and will be presenting a lecture on her current research. Esther M. Conwell has received the National Medal of Science from President Barack Obama. She received her medal from the President in the White House. A ceremony for the chemistry graduates of the Class of 2010. Networking Mixer! We will be raffling off another copy of The Merck Index at 6:30 PM. Remember, you must be present to win! Students from the Department will be presenting posters and following the poster session, the Department will be open for visitors. In commemoration of Professor Todd Krauss' astounding teaching. A gathering of the Synthesis, Catalysis, and Mechanism Cluster, including chemistry careers discussions and poster presentations. Three full meals provided! The presentation of the 2009 Harrison Howe Award to Professor Carolyn Bertozzi. A reunion of UR Chemistry alumni at the 238th ACS Meeting. A ceremony for the chemistry graduates of the Class of 2009. The picnic, put on by members of the Undergraduate Chemistry Council, celebrates our Chemistry senior graduating class. All are welcome to attend! An annual event which showcases all B.S. majors and their research. Please come support our seniors! A Department open house held for alumni, parents, and students attending Meliora Weekend. Prof. Sergey Kozmin of the University of Chicago has been selected to receive the Inaugural Magomedov-Shcherbinina Memorial Prize, and will be presenting a lecture on his current research. Alumni are cordially invited to attend a social hour taking place during the ACS 236th National Meeting and Exposition. A ceremony for the chemistry graduates of the Class of 2008. "Molecular Chemistry of Renewable Energy"
A Nanotechnology Symposium hosted by the University of Rochester Medical Center. A Happy Hour at the Gates Family Home to celebrate the 75th Anniversary of the Graduate Program in Chemistry. In conjunction with our commemorative event celebrating the 75th Anniversary of Chemistry’s graduate program, we hosted an Alumni Reception and Banquet following the afternoon Symposium. The celebration of the retirement of John S. Muenter and Robert W. Kreilick. A ceremony for the chemistry graduates of the Class of 2007. A memorial service for Carl A. Whiteman, laboratory instructor and research associate in the Department of Chemistry. A symposium celebrating the 60th birthday of Professor Douglas H. Turner. A ceremony for the chemistry graduates of the Class of 2006. A symposium honoring the 85th Birthday of Professor John R. Huizenga. A banquet honoring the 85th Birthday of Professor John R. Huizenga.